Ron Henderson is a long-time photo journalist from Scotland who has taken us to many out of the way places, where only hikers or cave explorers might otherwise see. He has also been a very good friend to the publisher of this online magazine. In the little community of Bosta on the island of Greater Bernera, just off Lewis, people had known for years that there was something under the sands of Bosta beach. Bits of combs and bowls, etc., had been turning up on the odd occasion. 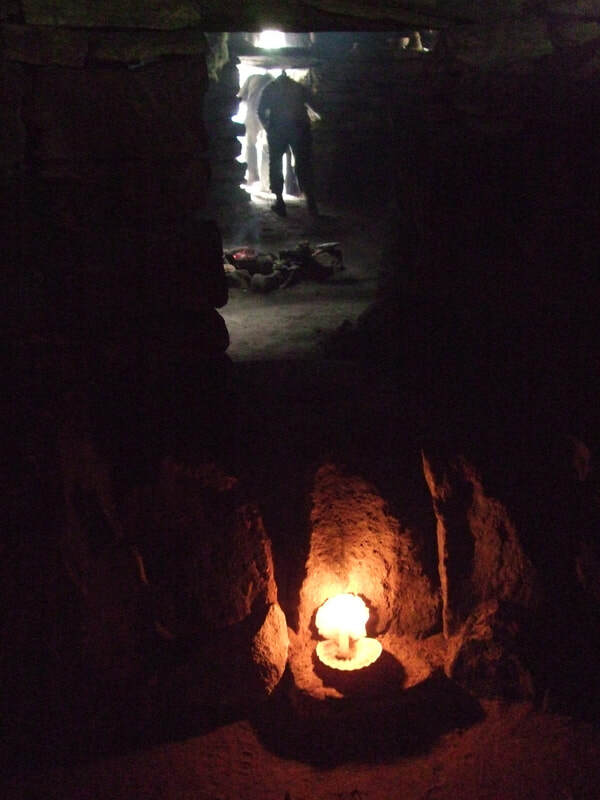 It wasn’t until a huge storm in the early 1990s uncovered some prehistoric dwellings that the reason was shown. There had been a community here at one time. The archaeologists got to work and found several Viking houses. But when they excavated further they were surprised to discover that the Viking houses had been built right on top of even older Pictish houses. These houses were made in a figure of eight form, with the main room being the one nearest the door and the other room being at the back. Similar to a ‘But and Ben’ in Scotland but with a narrow ‘waist’ like the shape of a wasp. You can still see But and Ben ruins dotted all over the country. There were no windows in the Pictish/Viking house and the smoke just went through the small hole in the thatch. The custodian of the building who is a native of Greater Bernera and is a fluent Gaelic speaker, told us that in the years that she had been looking after the place she had never experienced rain entering. It seems that the heat rising from the peat fire directly below causes the rain to be diverted – even in the heaviest of rainfall, she assured us. A replica house was built on a piece of clear land after the archaeologists had finished their work and the excavated houses were reburied leaving the top of the walls exposed to a depth of one foot. A subsequent storm completely covered these buildings with sand and there is no sign of them now. In the photo above you get the impression that what you are seeing are the walls of the house. In fact that is only a windshield. The actual dwelling is around four or five feet below that, under the ground. 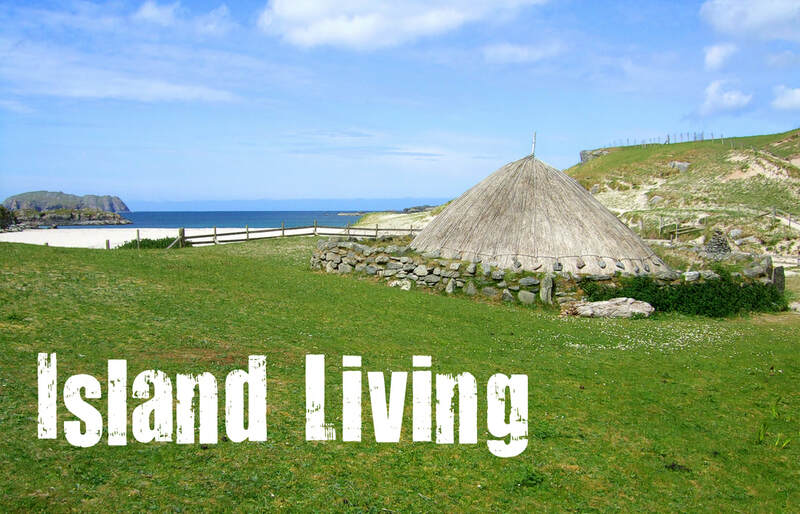 The walls were constructed with a cavity between them that was filled with dried peat and sand – cavity wall insulation from over 1,000 years ago! The chamber at the back is dug even further into the ground with the floor level around one and a half feet lower so that it remains colder than the main room at the front, where the fire is. This was where the occupants stored their perishable foodstuffs. It is believed that in the roof space they would have hung fish and fowl so that they would be dried and smoked from the peat fire. 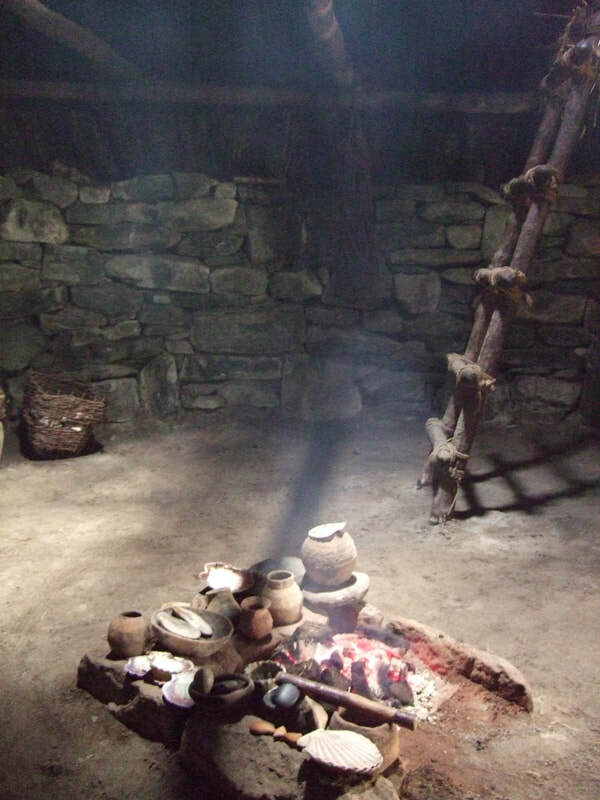 When you enter the Picts house you go into what appears to be impenetrable darkness, but after a moment or so your eyes become accustomed to the stygian blackness and you can make out the pots, ladder, shelves and the long bench that sat on one side of the room. These long benches were still being used in Highland black houses up until the 1950’s. I’ve sat on one and they’re really comfortable. Above: A peat fire towards the center of the main room sent smoke out a hole in the top of the dwelling without letting any rain in. Above: This photo, with the little light showing from a wee oil lamp (a cruse or cruise; from Gaelic: cruisgean or Norse: krus), was taken in the back room and you can make out two people leaving the building via the front door. And that, folks, is how our ancestors lived.